YANGON — Sitting at a crossroads between India, China and Thailand, and with eight major ethnic groups within its borders, it’s no surprise that Myanmar’s cuisine is diverse and eclectic. Nowhere is this more evident than in the commercial capital of Yangon, the country’s melting pot of cultures and flavors. Since the time when Yangon, then Rangoon, was a powerful economic hub of Southeast Asia, migrants from neighboring countries settled here in large numbers, bringing with them their food, culture, languages and religions. During military rule and since then, people have traveled to Yangon from all corners of the country in search of economic opportunities and better living standards, also bringing with them their favorite dishes. 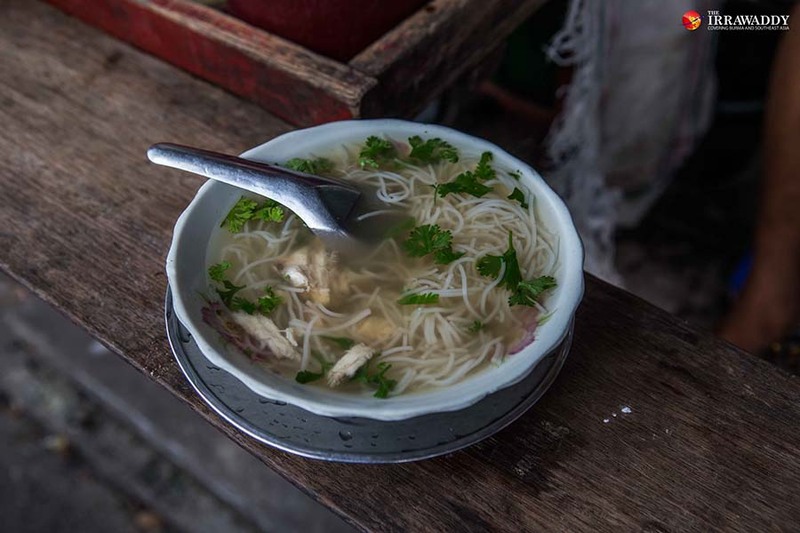 The climate, topography and socio-economy of these regions influence the diversity of ingredients, cooking methods and flavors in the dishes found in Yangon today. Here, The Irrawaddy outlines the diversity of Yangon as defined by seven distinct and popular dishes. Adventurous Chinese traders have been arriving in Myanmar for centuries with some, especially in upper Myanmar, settling here for good. During colonial rule too, Chinese immigrants were encouraged to move here for work and business opportunities, integrating with the Burmese over multiple generations. Today, ethnic Chinese own some of the largest businesses in Yangon including gold and gem companies and a number of private banks. 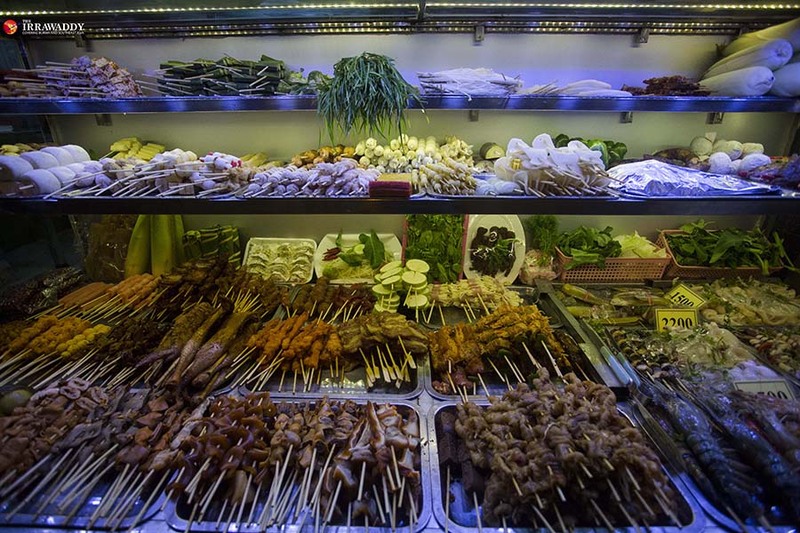 While Chinese food is diverse in itself, perhaps the most popular Chinese-influenced food in Yangon is barbecue. In Yangon’s “Chinatown,” located around Latha Township in the downtown area, you’ll notice a different type of Buddhist temple, architecture and foods for sale. Among the Chinese-influenced skewered vegetables and meats ready for seasoning and barbecuing, you’ll find pigs ear, eel, intestine and chicken feet. Moving east from Chinatown, you quickly enter Yangon’s Indian quarter, where residents of Indian descent have lived for generations. Many Indians came here during the country’s period of colonization when Myanmar was officially a province of British India. Though many were forced out of Myanmar during the socialist regime, there remains a sizable Indian population in central downtown and the rest of Yangon. 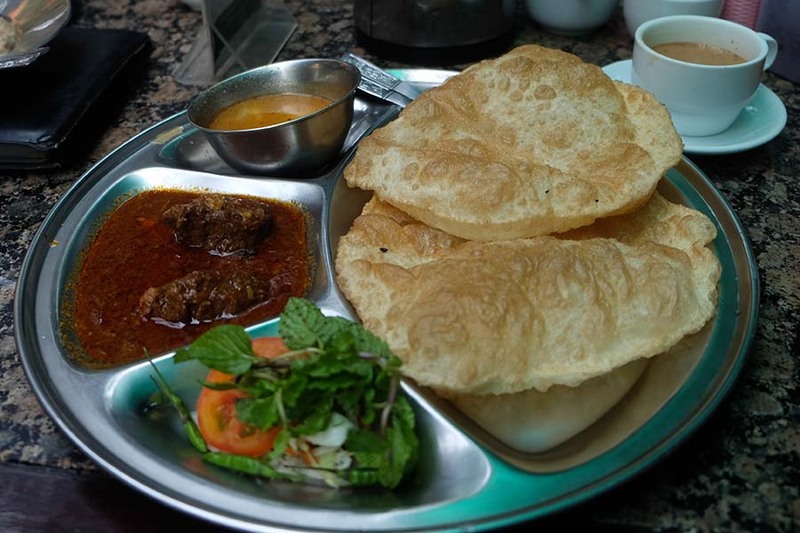 Nearly all teashops serve breakfasts of Indian influence. But most Yangoners love a good curry served on a thali platter — usually a meat curry served with potato curry, daal and various chutneys and pickles accompanied by poori, dosa, roti or rice. Since its founding as a fishing village built around Shwedagon Pagoda, a majority of Yangon’s population is and has always been Burmese, or Bamar. Curries are the foundation of Burmese cuisine. Usually made with a tomato base and onion, garlic and chili at their heart, chicken, pork, mutton, prawn and fish are the most common options. They are typically served with rice and a soup on the side. Historically, relations between Myanmar and Thailand were very rocky with several wars over territory. In more recent decades, members of Myanmar’s ethnic minorities have flocked across the border to escape persecution and in search of work. In 2017, the biggest group by nationality of visitors who visited Myanmar were Thais. Thai cuisine is popular in Yangon and there are many long-established and new Thai restaurants as well as Thai dishes on most restaurant menus. One of the most popular dishes served at these is tom yum soup. 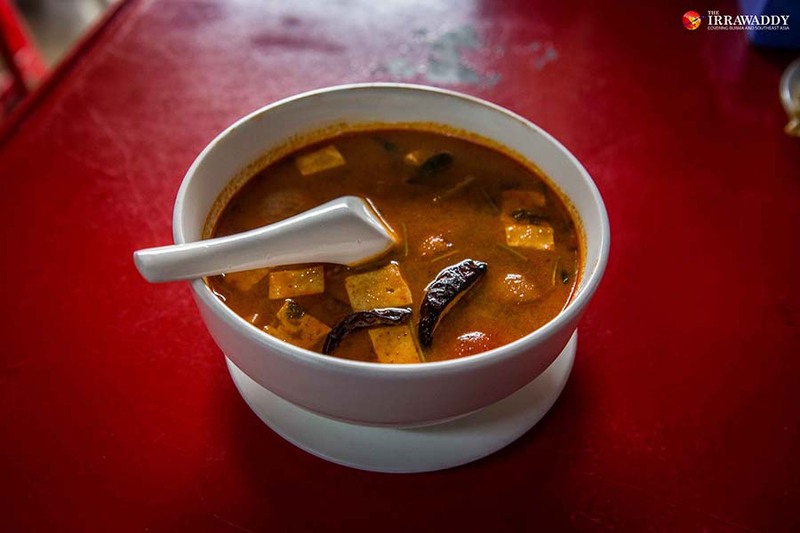 Soups feature often in Myanmar cuisine and the sour-spicy flavor of tom yum is perfect for the Myanmar palate. Shan State has a long and rich history and was the seat of powerful kingdoms at several points in time. Spread across cool highlands in the east, many say the country’s best vegetables come from Shan. The Shan cuisine is well developed and varied but almost all dishes are served with a side of pickled vegetables. 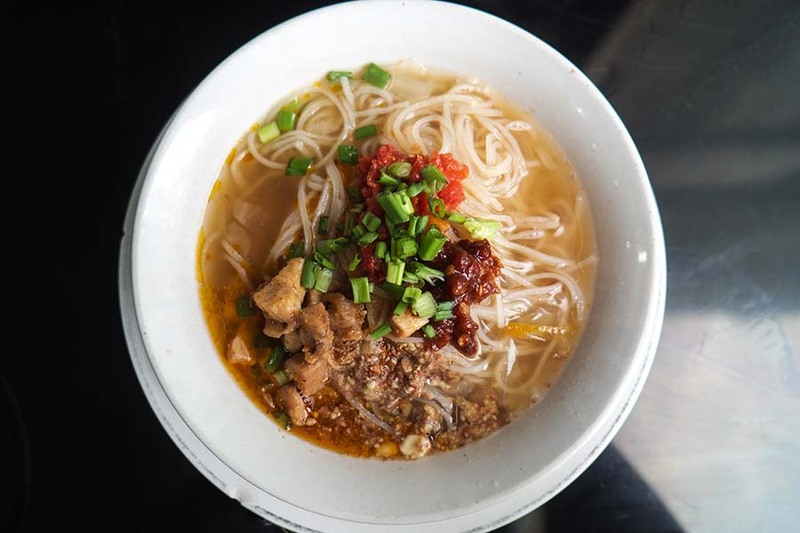 Shan dishes are served all across the country, but no Shan dish is more popular in Yangon than Shan noodles. Usually eaten for breakfast, dry or wet, the sticky rice noodles are topped with a herby tomato sauce, chicken or pork chunks flavored with spring onion, sesame seeds and peanuts. The Kachin, who refer to themselves as Jingphaw, being from the northernmost state at the foot of the eastern Himalayas, have a different style of cooking and flavor to others in Myanmar. The Kachin people did not consider themselves part of Myanmar before the British colonized the land. In Yangon, there is something of a Kachin enclave in the Sanchaung area. 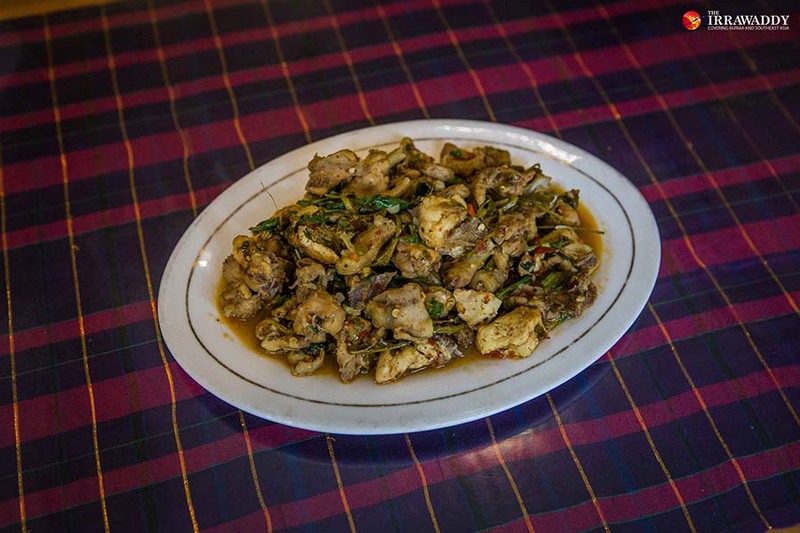 One distinctly Kachin dish is Kachin-style chicken curry, which has a deep, herby base with lots of cilantro and ginger. 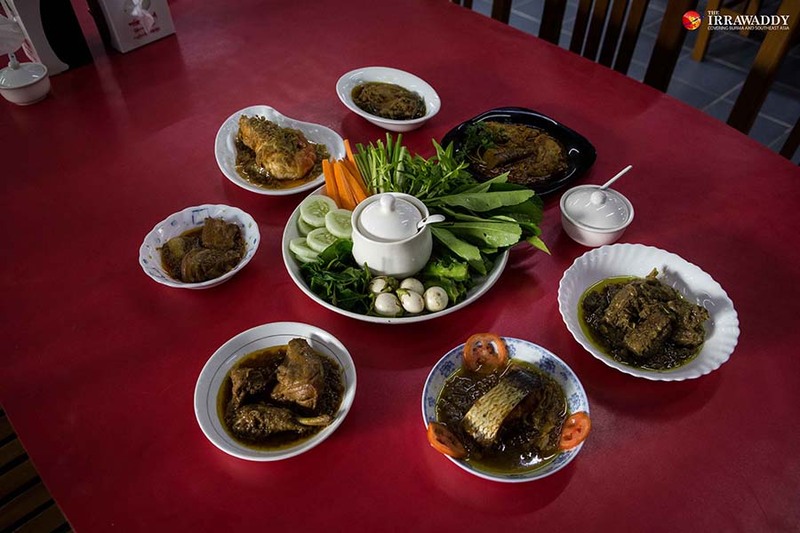 Rakhine cuisine makes the most of the state’s proximity to the sea but also uses lots of fresh green chili, which gives dishes a healthy, energizing spice kick. Mont dti is a simple dish with a base of rice noodles topped with fresh condiments like shallots, coriander, garlic, lemongrass, black pepper and a choice of fried pea fritters or chopped fish cake. It’s flavored with chili oil, garlic oil and soy or fish sauce with an option of adding salty fish broth or eating the noodles dry. To eat mont dti on the street is an experience in itself. Sit at a tiny stool next to a mobile food cart with steam wafting from the cauldron of fish broth and watch the mont dti master add dashes of toppings with precision. As a whole, with Yangon becoming an ever more international, cosmopolitan city, cuisines and cultures from all corners of the country and the world are getting more representation here. There are a small number of Mon, Chin, Kayan and Wa restaurants serving traditional favorites here and the food scene is also diversifying internationally with everything from German sausages to Mexican fajitas available for all to try.